Rutgers Coding Bootcamp, in Somerset and Jersey City, equips learners with the programming skills needed for a career in web development and technology through live, in-person classes. Rutgers Data Science Bootcamp, in Somerset and Jersey City, prepares professionals with the fundamental and specialized skills necessary to land a job in the booming field of data analytics. Rutgers, The State University of New Jersey, is a leading national research university and the state of New Jersey’s preeminent, comprehensive public institution of higher education. Established in 1766 and celebrating a milestone 250th anniversary in 2016, the university is the eighth oldest higher education institution in the United States. More than 66,000 students and 22,000 faculty and staff learn, work, and serve the public at Rutgers locations across New Jersey and around the world. Why Get Skills-Based Training at Rutgers? Rutgers Bootcamps equip you with the necessary skills to help guide you down a path to success. With innovative curricula, a hands-on classroom environment, and expert instructors; you’ll receive an education worthy of the Rutgers name. Our programs cover the most in-demand market skills* across web development and data science. 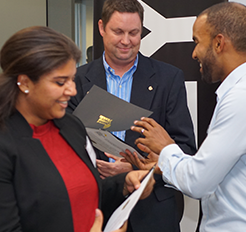 Students receive support services to equip them for success while taking coding or data analytics bootcamps in Somerset and Jersey City, NJ. You will build a comprehensive portfolio of web applications and projects to showcase your knowledge. Our data and coding programs offer a part-time schedule, allowing students to study without leaving work. For those who wish to study at an accelerated pace, our coding program offers a full-time option. You will receive a certificate of completion from New Jersey’s #1 Public Institution. Rutgers Bootcamps were designed to help students develop the skills and professional network needed to capitalize on the high-demand career tracks of web development and data analytics in and around Somerset and Jersey City, NJ. Whether you pursue web development or data analytics, students learn the fundamental skills they need in order to be competitive in these industries. Students receive career-planning services including portfolio reviews, mock interviews, soft-skills training, 1:1 coaching, and more to help position them for success in the field. Our dynamic curricula include skills in programming or data analytics that are valued in your local job market TODAY. Our face-to-face class structure allows students access to instructors and TAs for individual assistance to strengthen understanding. Benefit from a robust set of career-readiness services to prepare you for success as you work to advance or change careers. A Certificate of Completion from Rutgers University, showcasing your accomplishment to future employers. Hands-on experience and a robust portfolio of applications and projects to demonstrate your working knowledge. Want to learn about the Rutgers Coding and Data Science Bootcamp student experience from real Rutgers Bootcamp graduates? Check out our website coding bootcamp testimonials and reviews from our Somerset and Jersey City locations.